The 2013 horse meat scandal was a scandal in parts of Europe in which foods advertised as containing beef were found to contain undeclared or improperly declared horse meat – as much as 100% of the meat content in some cases. A smaller number of products also contained other undeclared meats, such as pork. The issue came to light on 15 January 2013, when it was reported that horse DNA had been discovered in frozen beefburgers sold in several Irish and British supermarkets. The analysis stated that 23 out of 27 samples of beef burgers also contained pig DNA; pork is a taboo food in the Muslim and Jewish communities. While the presence of undeclared meat was not a health issue, the scandal revealed a major breakdown in the traceability of the food supply chain, and the risk that harmful ingredients could have been included as well. Sports horses, for example, could have entered the food supply chain, and with them the veterinary drug phenylbutazone which is banned in food animals. The scandal has since spread to 13 other European countries, and European authorities have decided to find an EU-wide solution. They initiated meat testing of about 4,000 horse meat samples for the veterinary drug. Investigations by the Food Safety Authority of Ireland (FSAI) resulted in Ireland being the first EU state to report the presence of horse meat in beef and make the results public. The first positive test for equine DNA was on 10 December 2012. It carried out additional tests on 18 and 21 December. The FSAI then sent samples to the Eurofins laboratory in Germany. Professor Alan Reilly of the FSAI testified to the Oireachtas on 5 February 2013 that the results indicated the presence of equine DNA, but not the amount. The IdentiGen Laboratory and the Eurofins Laboratory were asked to determine the amount of horse meat in the samples. On 21 December 2012, the FSAI requested that the Department of Agriculture, Food and the Marine in Ireland obtain further samples. These were sent to the Identigen laboratory on 4 January 2013. Results were received back from Eurofins and Identigen on 11 January 2013. Professor Reilly reported on 5 February that quantitative results from Identigen were received by the FSAI late on the evening of 11 January 2013. Of the ten burger products that tested positive for equine DNA, all but one was at low levels. The quantification of the equine DNA in this one burger product gave an estimated amount of 29% equine DNA relative to the beef DNA content of the burger product. This product was manufactured by Silvercrest on behalf of Tesco. At this point, there was no explanation for the finding of 29% equine DNA relative to beef DNA in this single sample. On 14 January 2013 the FSAI informed the Department of Health and the Department of Agriculture, Food and the Marine of the final results. On the same day it also informed the Food Standards Agency in the United Kingdom. The next day, 15 January 2013, the FSAI advised the five retailers concerned, Tesco, Dunnes Stores, Aldi, Lidl and Iceland, of their findings; all these firms withdrew the offending products. The media and newspapers of 16 January 2013 led with the story, focusing on the one burger which tested positive for 29% equine DNA. Of 27 beef burger products tested, 37% were positive for horse DNA, and 85% were positive for pig DNA. Of 31 beef meal products tested, 21 were positive for pig DNA but all were negative for horse DNA. 19 salami products were tested but were negative for all foreign DNA. Of the 37% of beef products tested positive for horse DNA, Tesco's inexpensive Everyday Value Beef Burgers tested at 29.1%. All other reported brands had less than 0.3% horse DNA. These products originated from Liffey Meats and Silvercrest Foods in Ireland and Dalepak Hambleton food processing plant in the United Kingdom. Trace amounts of horse DNA were also found in raw ingredients imported from Spain and the Netherlands. By 16 January 2013 four subsidiaries of ABP had been accused of supplying adulterated meat. They were Silvercrest in County Monaghan, Dalepak in North Yorkshire, Freshlink in Glasgow, ABP Nenagh in County Tipperary, Ireland and Dairy Crest, Rossington. Hamburger meat from Silvercrest Foods, a subsidiary of Larry Goodman's ABP Food Group, in County Monaghan, Ireland, was found to contain 29% horse meat relative to beef. Porcine DNA was also found. Tesco dropped Silvercrest as a supplier of processed meat, but ABP said that it "welcomed their decision to continue sourcing fresh beef from other ABP companies". On 15 February 2013 Tesco said, "We will no longer work with the suppliers who fell below our very high standards." The first apparent instance of fresh beef being adulterated with horse meat was reported by Asda, which removed its 500-gram own-label beef Bolognese sauce from sale. The sauce was supplied by Greencore, which said in a statement that the meat in the sauce had been supplied by ABP Food Group's Nenagh plant in County Tipperary, Ireland. On 4 March 2013 Greencore announced that "multiple further tests for the presence of equine DNA on the same batch of the same product using both screening and quantitative tests (in line with FSA testing protocols) at two different, independent accredited laboratories have all produced negative results" and "an extensive programme of testing of other finished product and raw material at the Bristol facility has produced negative results for the presence of equine DNA. The investigation of the overall incident, overseen by an independent expert... included an audit of ABP Food Group's plant in Nenagh, Ireland... found no evidence of contamination in the supply chain." Burger King, which has more than 500 fast food outlets in Ireland and the UK, dropped Silvercrest as a supplier, using suppliers in Germany and Italy instead, after horse meat was found in their supply chain. Waitrose removed beef meatballs from sale when it found that they contained pork. The meatballs were manufactured by an ABP factory in Glasgow. Waitrose, part of John Lewis, said it would be creating a new facility to supply its own beef products. Tesco, the Co-operative Group and Aldi also cancelled contracts with ABP Food Group because of the adulteration. Food wholesaler Makro, supplier to the restaurant and pub industry, announced that some of its frozen burgers supplied by Silvercrest tested positive for horse DNA. A spokesman said that Makro no longer sold the product in question. On 14 February 2013, the French government stated that French meat processing company À la Table de Spanghero knowingly sold horse meat labelled as beef, and that their licence was suspended while an inquiry continues. Spanghero imported meat from Romania and sold it on to another French company, Comigel, which made frozen ready meals at its factory in Luxembourg. French Consumer Affairs Minister Benoît Hamon said the meat had left Romania clearly and correctly labelled as horse and that it was afterwards that it was relabelled as beef by Spanghero. The investigation also said some blame may rest with Comigel, claiming the staff there should have noticed anomalies in the paperwork, and realised from the smell and look of the meat once it was defrosted that it was not beef. On 7 February 2013, Findus announced that in a sample of 18 beef lasagne products that it tested, 11 contained between 60% and 100% horse meat. It was also revealed that some of the products sold had minced meat declared as beef that was 60–100% horse meat. The source of the horse meat was third party supplier Comigel, a French-headquartered frozen ready meal producer, from its subsidiary Tavola factory in Capellen, Luxembourg. According to the FSA the company had been alerted by a third-party French supplier on 4 February 2013, and tested its beef lasagne products finding over 50% of the tested products contained horse meat. According to reports both Findus UK and the French supplier withdrew all products related to the third party supplier. The reason for the adulteration was initially stated as "highly likely" criminal activity. The president of Comigel, Erick Lehagre, told Agence France-Presse that the adulterated meat supplier was Spanghero, a firm owned by Lur Berri and founded in 1970 by Claude and Laurent Spanghero, two former France international rugby players. He said that Spanghero had told him that the meat was not from France, but came from a producer in Romania. On 11 February 2013 France's Consumer Affairs Minister Benoit Hamon warned it "will not hesitate" to take legal action if there is evidence companies had knowingly duped consumers. Hamon said an initial investigation by French safety authorities had found a French company Poujol (Spanghero's holding company) bought frozen meat from a Cypriot trader. That trader had bought it from Dutch food supplier Draap (the Dutch word for horse, Paard spelled backwards), owned by Jan Fasen, who was previously convicted for horse meat fraud in 2007. Draap, in turn, bought it from two Romanian slaughterhouses. Poujol then supplied a factory in Luxembourg, owned by Comigel, which then supplied Findus and the British supermarkets. The Romanian government has stated that there are no contracts between the Romanian abattoirs and any French, Cypriot or Dutch meat processors. On 8 February 2013, Findus announced that it would no longer accept meat from Comigel, and stopped further deliveries of the product in question. On the same day, Findus UK published a public apology on its website, also announcing that, following DNA testing, three of its products were found to contain horse tissue. These are the 320, 350 and 500 gram packages of Findus Beef Lasagne; the company offered a refund for products purchased. Findus Sverige AB also announced a recall of its 375 gram packs of ready-made single-portion lasagne (code 63957), and published a contact number for customers who had already purchased the products. On 8 February 2013 supermarket chain Aldi announced that it would withdraw from sale Today's Special Frozen Beef Lasagne and Today's Special Frozen Spaghetti Bolognese, supplied by Comigel, after tests found the meat content to be between 30 and 100% horse. The Swiss-based company Nestlé reported on 18 February 2013 that it had found more than 1% horse DNA in two beef pasta products. It withdrew chilled pasta products, Buitoni Beef Ravioli and Beef Tortellini, in Italy and Spain. Sourced from sub-contractor HJ Schypke, itself a German sub-contractor of Belgian-based Nestlé supplier JBS Toledo, also withdrew frozen Lasagnes à la Bolognaise Gourmandes, a product for catering businesses produced in France. On 22 February 2013, Birds Eye revealed that DNA tests showed that horse meat was present in Birds Eye chili con carne sold in Belgium and supplied by Belgium firm Frigilunch. Birds Eye withdrew three ready meals that contained beef from sale in the UK. All of the frozen beef products produced by Sodexo, "one of the largest private catering businesses in Britain", were withdrawn on 22 February 2013 following the discovery of horse DNA in a sample. The company supplies 2,300 institutions within the UK, including schools, old-age people homes, prisons and branches of the armed forces . On 1 March the Department of Food and Veterinary of Lithuania announced that horse meat was found in three canned beef brands sold by Latvian company Kuršu Zeme. Canned beef made by the Latvian company was removed from sale in Lithuania. On 10 April 2013, it was reported that two Dutch trading companies owned by the same person who had previously been investigated by food safety officials may have supplied 50 000 metric tonnes of adulterated beef containing horse meat since January 2011. On 7 February 2013, it was revealed by the Food Standards Agency that the Findus beef lasagne range in the UK, France and Sweden and the shepherd's pie and moussaka ranges in France contained horse meat without proper declaration or official scrutiny . The contamination may have gone on since summer 2012 according to a leaked document. Compass Group was the world's biggest catering firm at the time and discovered through conducting tests that it was unknowingly supplying concealed horse meat in food products to a "small number" of schools in Northern Ireland. Whitbread, which was at the time Britain's biggest hotel group also discovered through tests that it had unknowingly sold concealed horse meat in food products. The horse meat that was found in Comigel products originated at Doly Com, a Romanian-based slaughterhouse. An inquiry by the French government showed that "the meat had left Romania clearly and correctly labelled as horse. It was afterwards that it was relabelled as beef." Doly Com supplied the horse meat under a contract to Cyprus-based Draap Trading Ltd, a meat trader which operates in the Netherlands. It is owned by a British Virgin Islands holding company, and Jan Fasen is a director. Draap spelt backwards is paard, the Dutch word for horse. After having the horse meat delivered to a cold storage company in Breda, Draap then sold the frozen meat to Spanghero, who insist that it arrived at their Castelnaudary plant labelled as "Beef – originating in EU". After some processing, Spanghero then sent it to Comigel, where the end products for sale were made. According to French media reports, Spanghero falsified documents regarding the meat. Horse meat found in Silvercrest products is thought to have originated in Poland. A small survey, part of the EU-funded project FoodRisC, by a team from University College Dublin and Brunel University found that health risks were not respondents' first concern, but rather that the claims made on labels did not match the contents of food products. Additional concerns included allegations that a "French plant which handled horse meat sold in Britain as beef has previously been at the centre of a major E.coli discovery". Inquiry into horse meat sources in the UK also revealed that Aintree racecourse has a contract with a licensed slaughterhouse in West Yorkshire to remove dead Grand National race horses. It is illegal for horses euthanised by injection to be put into the human food chain. Many chemical agents used for animal euthanasia leave residues in the meat which may be harmful to humans, and have caused sickness and death in animal predators and scavengers. Aintree officials stated they were "as confident as we possibly can be that no unfit meat ever reaches the human food chain." In January 2013, concerns first arose about the possibility that horse meat containing traces of the veterinary drug phenylbutazone could enter the human food chain, in spite of regulations that horses treated with it cannot legally be used for human consumption. The drug, commonly known as "bute", is used as an analgesic in horses. The issue was also raised by politicians such as Labour party MP Mary Creagh. In response, the Food Standards Agency (FSA) initially stated that there had been only five cases of slaughtered horses in the UK which had been treated with phenylbutazone, none of which had entered the human food chain. A subsequent review of 206 horse carcasses slaughtered in the UK between 30 January and 7 February 2013 found eight were contaminated with phenylbutazone, six of which had been shipped to France. The UK's Chief Medical Officer, Sally Davies, said the level of contamination, 1.9 mg/kg, posed "very little risk to human health". She added that around 500–600 burgers containing 100% horse meat would need to be eaten to receive the daily human therapeutic dose. Additional tests at that time indicated than none of the products from Findus contained phenylbutazone. Another report found that between two and five percent of samples tested between 2007 and 2011 had phenylbutazone contamination, and that only 50 samples per year were tested. In 2012, 145 carcasses had been tested, and two out of the nine carcasses found positive for bute that year were not reported to the FSA for seven months. In April 2013, the FSA reported it had not only found more than 1% horse DNA in Asda's 340 gram tins of "Smart Price Corned Beef" but it also contained four ppb of phenylbutazone, marking the first time since the start of the scandal that bute had been detected in a meat product in the UK food chain. However, one problem raised was over documentation; all of the UK animals with phenylbutazone contamination tested in early 2013 possessed a "horse passport" that allowed the carcasses to be sold for human consumption. The veterinary residues committee (VRC) reminded the public in July 2012 that it had been "repeatedly expressing concern" about phenylbutazone contamination. and recent discoveries of contamination suggest that the passport system was not working. Phenylbutazone is used therapeutically in humans as a treatment for ankylosing spondylitis when other treatments are not suitable. The effect on humans of low-level exposure over an extended period has not been extensively formally studied. High incidences of focal necrosis were found in female rats fed low doses of 1,2-diphenylhydrazine over time. Non-steroidal anti-inflammatory drug (NSAID) residues risk causing rare, but potentially fatal side-effects in humans. There is inadequate data on carcinogenicity of phenylbutazone; it is not classifiable as to its carcinogenicity to humans. There is also speculation that some horse meat from the United States, where phenylbutazone is commonly used, may have entered the food chain via Mexico and then been exported to Europe. One reason for this is that Spanghero had purchased meat from a company, Draap, whose owner, Jan Fasen was previously convicted for fraud; as long ago as 2007, Draap had labelled horse meat imported from Mexico and South America as Dutch or German beef. The primary concern is horse meat from the United States: up to 15% of horses sent to slaughter in Canada or Mexico are former racehorses that have been given drugs during their racing career, such as phenylbutazone, which are approved for use in horses but not humans and carry the warning "Do not use in horses intended for human consumption." Further, they are given medication at levels that led a research veterinarian to call them "walking pharmacies". These animals may have meat too toxic to eat safely. Some experts and UK government officials have raised concerns that horse meat from Romania could be contaminated with equine infectious anaemia (EIA). Although EIA does not pose a risk to humans, it could be an indicator of additional health problems in horses that may stem from poor living conditions. Since 2007, the European Union has restricted export of live horses from Romania to any other EU member state unless the animals have a Coggins test for EIA prior to export. Environment secretary Owen Paterson stated that "Romanian horse meat is not allowed in", though he acknowledged that it could be a serious problem if Romanian horse meat from animals with EIA had been imported. Some news outlets referred to EIA as "Horse AIDS", even though it is not an immunodeficiency syndrome and the retrovirus that causes it is equid-specific. EIA is, however, a lentivirus, like HIV, and thus research on EIA has the potential to help research efforts with HIV/AIDS. An article by Will Hutton about contamination in the UK lays much of the responsibility at the door of those who have (in the name of relaxing stifling red tape) removed much of the regulation of the meat industry, and cut the budgets and workforces—halving the number of inspectors—of those responsible for enforcing the remaining regulations. Another article points out that "Long business supply chains are corruptible and can hide a multitude of crimes if no one checks for fraud or criminal activity". In Britain, the incident was a catalyst for the discussion of the validity of a self-regulated meat industry. Karen Jennings, assistant general secretary of the UNISON trades union, said that "the industry isn't fit to regulate itself". Observant Muslims and Jews consider it sinful to eat certain types of meat, pork for both groups and also horse and many other animals for Jews, due to religious prohibitions. Professor Reilly stated "for some religious groups or people who abstain from eating pig meat, the presence of traces of pig DNA is unacceptable". On 15 March 2013 it was confirmed by a Westminister wing on Health and Safety that pig DNA had been found in halal chicken sausages produced for schools. Horse meat is not normally eaten in Ireland and Britain. According to Professor Reilly, chief executive of the FSAI, "In Ireland, it is not our culture to eat horse meat and therefore, we do not expect to find it in a burger". Silvercrest, a subsidiary of ABP Foods has claimed that there is no risk to the public upon eating the foreign meat. Eleven firms, including Tesco and Asda, said they shared shoppers' "anger and outrage". Whitbread vowed to remedy the unacceptable situation. The Food Standards Agency's (FSA) chief executive, Catherine Brown also said "it is unlikely we will ever know" how many unwittingly ate horsemeat. Tesco's market value dropped by €360 million. European Union officials, European ministers and Commissioner (Tonio) Borg set up an urgent meeting in Brussels on 13 February 2013 on how to contain the horse meat scandal that exposed flaws in European control systems on food safety, and to formulate an action plan. Following the meeting, EU agriculture ministers announced a three-month programme of DNA testing of processed meat across the European Union. The plan calls for 2,500 random tests on processed food for horse DNA and 4,000 for phenylbutazone (bute), beginning in March 2013, with initial results announced on 15 April 2013. It is unclear why the testing could not start immediately as most of the evidence is still present. The scale of DNA tests in April and May would be decided later. The Hague-based Europol would handle co-ordination of the investigations among national authorities and any raids on premises as well as arrests on suspicion of criminal conspiracy to defraud. 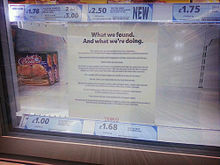 On 26 February 2013 it was announced that sales of frozen hamburgers had fallen by 43% and frozen ready meals by 13% from levels before the scandal. The study took place 21 January – 17 February. Sales of bona fide horse meat, on the other hand, increased in those EU countries where it is moderately common. On 23 May 2013, a Dutch meat wholesaler, Willy Selten, was arrested for allegedly selling 300 tonnes of horsemeat as beef. Selten, who owns the meat wholesaler Willy Selten BV, was arrested together with the company's interim director. In October Barry Gardiner MP, the UK shadow Environment minister criticised the lack of prosecutions of leading players ten months after David Cameron promised that everything possible would be done to deal with a "very shocking" crime. Gardiner said "The extraordinary thing is that because of its clout, industry has been able to commit what appears to be a criminal offence – selling the public horsemeat falsely labelled as beef – and just say they are sorry and didn't know." On 26 August 2016, three men were charged by the City of London Police with fraud offences relating to the sale of mixed beef and horsemeat products that were sold as beef between 1 January 2012 – 31 October 2012. In December 2013 consignments of horse meat were seized and arrests made. 21 people were arrested on Monday 16 December in various parts of the South of France. This meat was from horses that had been kept on a farm attached to a scientific laboratory, and was not certified as fit for human consumption. A dealer from Narbonne was helping police with enquiries. 2013-01-11 Samples that FSAI requested from Department of Agriculture, Food and the Marine on 21 December, of raw ingredients from the two implicated meat processing plants in Ireland. And analysed by the Identigen laboratory on show of 4 January 2013ed very low or trace levels of equine (horse) DNA in beef products from the Netherlands, Spain and Ireland. However, they were not linked as ingredients. FSAI receives Semi-quantitative results from the Eurofins laboratory (Germany) that corroborates the initial results from the Identigen laboratory. Quantitative results from Identigen lab indicates that only 1 of 10 burgers tests showed an estimated low 29% level of equine (horse) DNA. This product was manufactured by Silvercrest on behalf of Tesco. 2013-01-15 The Food Safety Authority of Ireland (FSAI) announced that horse meat had been found in frozen beefburgers at several Irish and British supermarkets, including Tesco, Asda, Dunnes Stores, Lidl, Aldi and Iceland. The FSAI conducted tests on a selection of beef and salami products with "best before" dates between June 2012 and March 2014. FSAI advises the five retailers concerned (Tesco, Dunnes Stores, Aldi, Lidl and Iceland) of their findings. The implicated products are removed immediately. ^ a b c d "Findus beef lasagne contained up to 100% horsemeat, FSA says". BBC News. 7 February 2013. Retrieved 7 February 2013. ^ a b Meikle, James; McDonald, Henry (16 January 2013). "Cameron tells supermarkets: horsemeat burger scandal unacceptable". The Guardian. London. ^ "Horse meat scandal: timeline". The Daily Telegraph. Retrieved 16 July 2017. ^ "Results of Burgers Analysed" (PDF). Food Safety Authority of Ireland. 22 January 2013. Retrieved 16 March 2013. ^ a b c d e f g h i j k l m n o p q "CEO Statement to the Joint Oireachtas Committee on Agriculture, Food and the Marine". 5 February 2013. Retrieved 15 February 2013. ^ Horse DNA found in beef burgers, Raidió Teilifís Éireann, 24 January 2013. Retrieved 15 February 2013. ^ "How the horsemeat scandal unfolded – timeline". The Guardian. London. Press Association. 15 February 2013. Retrieved 15 February 2013. ^ "Equine DNA & Mislabelling of Processed Beef Investigation" (PDF). Agriculture.gov.ie. Retrieved 3 June 2015. ^ "The Role of the Food Standards Agency must be clearer". UK Parliament. ^ Alison Healy (13 January 2014). "Goodman firm says horse meat crisis has changed it for the better". Irish Times. Retrieved 2 June 2015. ^ "Elliott review into the integrity and assurance of food supply networks: interim report". www.gov.uk. ^ "FSAI Survey Finds Horse DNA in Some Beef Burger Products". Food Safety Authority of Ireland. 15 January 2013. Retrieved 16 January 2013. ^ "Horse DNA found in some beef burger products". Fsai.ie. 15 January 2013. Retrieved 22 January 2013. ^ Lichfield, John (10 February 2013). "Horsemeat found in British supermarkets 'may be donkey'". The Independent. London. Retrieved 11 February 2013. ^ "Southampton company PrimerDesign help tackle horse meat food scandal | SETsquared Partnership". Setsquared.co.uk. Retrieved 28 May 2014. ^ Miller, Tracy (1 February 2013). "Burger King: There is NO horse meat in our burgers — and we've got the DNA tests to prove it". Daily News. New York. Retrieved 13 February 2013. ^ "Tesco comments on test results" (Press release). Tesco PLC. 15 February 2013. Retrieved 17 February 2013. ^ Carrington, Damian; Meikle, James; Neville, Simon (15 February 2013). "Horsemeat scandal: 'fresh beef' discovery as tests overwhelm laboratories". The Guardian. London. Retrieved 14 February 2013. ^ "Three held in horsemeat mislabelling investigation". BBC News. 14 February 2013. Retrieved 14 February 2013. ^ "Greencore update re ASDA product withdrawal and ongoing testing". ^ Gleeson, Colin (24 January 2013). "Burger King drops Silvercrest as supplier". The Irish Times. ^ "Neigh!!!! : Burger King finally admits it has been selling beef burgers containing horsemeat : ChatyChaty.com". 31 January 2013. ^ Meikle, James; Lawrence, Felicity; Buckley, Jemma (31 January 2013). "Burger King reveals its burgers were contaminated in horsemeat scandal". The Guardian. London. Retrieved 25 February 2013. ^ "'Pork' meatballs withdrawn by Waitrose made in Glasgow factory". BBC News. 13 February 2013. Retrieved 14 February 2013. ^ Sheehan, Aideen (26 January 2013). "Waitrose ditches burgers linked to Irish firm". The Irish Independent. Archived from the original on 26 January 2013. Retrieved 26 January 2013. ^ Sheehan, Aideen (23 January 2013). "Horsemeat issue sees Burger King drop Irish supplier". The Irish Independent. Archived from the original on 26 January 2013. Retrieved 26 January 2013. ^ Healy, Alison (31 January 2013). "Silvercrest says sorry after loss of contracts with two supermarket chains". The Irish Times. Archived from the original on 31 January 2013. Retrieved 31 January 2013. ^ Harrington, John (17 January 2013). "Makro withdraws selected frozen burgers after horse meat scare". The Publican's Morning Advertiser. Retrieved 14 February 2013. ^ "Horsemeat scandal: FSA inquiry 'will be relentless'". BBC News. 13 February 2013. Retrieved 14 February 2013. ^ a b c d "Horsemeat scandal: France blames processor Spanghero". BBC News. 14 February 2013. Retrieved 14 February 2013. ^ Lawrence, Felicity (7 February 2013). "Findus beef lasagne withdrawn after tests show high level of horsemeat". The Guardian. London. Retrieved 9 February 2013. ^ a b "Findus Beef Lasagne Meals 100% Horsemeat". Sky News. 8 February 2013. Retrieved 7 February 2013. ^ a b c "Horsemeat scandal: Don't dump meat, says food minister". BBC News. 8 February 2013. Retrieved 8 February 2013. ^ a b Sawer, Patrick; Ensor, Josie (9 February 2013). "French firm supplying horse meat was previously at centre of E.coli scare". The Daily Telegraph. London. Retrieved 14 February 2013. ^ "Lasagnes à la viande de cheval : une fraude à l'échelle européenne". Libération. 8 February 2013. Retrieved 14 February 2013. ^ a b c d e Lawrence, Felicity (15 February 2013). "Horsemeat scandal: the essential guide". The Guardian. London. Retrieved 15 February 2013. ^ "Horsemeat Legal Action Starts in Europe". Sky News. 11 February 2013. Retrieved 12 February 2013. ^ "Findus UK | Good Food Made Findusly Simple!". Findus.co.uk. 4 February 2013. Retrieved 9 February 2013. ^ "Findus Sverige AB – Findus återkallar 1-portion Lasagne, 375 gram, artikelnummer 63957". mynewsdesk.com. Retrieved 9 February 2013. ^ a b c "Nestle removes beef pasta meals after finding horsemeat". BBC News. 18 February 2013. Retrieved 18 February 2013. ^ a b "Nestlé finds horsemeat in pasta meals". The Guardian. London. 19 February 2013. Retrieved 19 February 2013. ^ "Supplier found to have mislabeled beef". Nestlé. 18 February 2013. Retrieved 18 February 2013. ^ a b "Horsemeat scandal: Birds Eye withdraws UK ready meals". BBC News. 22 February 2013. Retrieved 22 February 2013. ^ a b c Meikle, James (22 February 2013). "Horsemeat scandal: schools caterer suspends all frozen beef products". The Guardian. London. Retrieved 23 February 2013. ^ "Arklienos rasta "Turistų pusryčiuose" ir kituose konservuose". verslas.delfi.lt. 1 March 2013. Retrieved 2 March 2013. ^ ""Maxima" iš prekybos šalina latviškus konservus, tiriamus dėl arklienos". verslas.delfi.lt. 28 February 2013. Retrieved 2 March 2013. ^ "Horsemeat scandal: Dutch uncover large-scale meat fraud". BBC News. 10 April 2013. Retrieved 10 April 2013. ^ a b Reuters (15 February 2013). "Compass and Whitbread caught up in horse meat scandal". The Daily Telegraph. ^ a b "Compass, Whitbread drawn into horsemeat scandal". reuters.com. ^ a b c "Horsemeat: Compass and Whitbread find horse DNA in products". BBC News. ^ a b c "Horsemeat scandal: Supermarkets 'share anger and outrage'". BBC News. ^ a b "Catering & Hospitality News". Thecaterer.com. Retrieved 2 June 2015. ^ a b Paul Owen. "Horsemeat scandal: FSA raid three new premises". the Guardian. ^ "Analyzing Horse Meat Scandal, Its Effects, and How it Progressed". The World Reporter. 14 March 2013. Retrieved 4 March 2013. ^ "Horsemeat scandal: France blames processor Spanghero". BBC News. 14 February 2013. Retrieved 17 February 2013. ^ a b Harding, Luke; Traynor, Ian (13 February 2013). "Horsemeat scandal: Dutch meat trader could be central figure". The Guardian. London. Retrieved 18 February 2013. ^ "First legal suits are filed over horse-meat fraud". Japan Times. 11 February 2013. ^ a b "Food safety watchdog may report Findus". 10 February 2013. Archived from the original on 26 September 2013. ^ Driver, Alistair. "ABP sourced contaminated Polish horse meat from Irish trader". Farmers Guardian. Archived from the original on 10 February 2013. Retrieved 17 February 2013. ^ "Horse meat health risks 'not a concern', 21 February 2013". irishhealth.com. Retrieved 11 April 2013. ^ a b c Watts, Robert; Sawer, Patrick; Donnelly, Laura (9 February 2013). "Horse meat scandal: 'More contaminated food likely to be found'". The Telegraph. London. Retrieved 14 February 2013. ^ a b c d e f James Gallagher (14 February 2013). "Horsemeat scandal: Bute found in eight horse carcasses". BBC. Retrieved 18 February 2013. ^ "AVMA Guidelines on Euthanasia" (PDF). AVMA Panel on Euthanasia. June 2007. p. 18. Retrieved 18 February 2013. ^ a b c "UK vets have 'repeatedly raised concerns' over bute in food". BBC News. 8 February 2013. Retrieved 15 February 2013. ^ a b Molloy, Mark (24 January 2013). "Horse meat burger scandal: 'Carcinogen phenylbutazone found in meat' | Metro News". Metro. UK. Retrieved 15 February 2013. ^ Sally Davies, England's chief medical officer (14 February 2013). "Horse meat: health officials reassure as bute carcasses sent to France – again". Retrieved 14 February 2013. ^ a b Damian Carrington; James Meikle (14 February 2013). "Horsemeat scandal deepens as minister says bute may be in food chain | The Guardian". The Guardian. London. Retrieved 11 April 2013. ^ "Veterinary drug found in Asda budget corned beef". BBC. 9 April 2013. Retrieved 10 April 2013. ^ "Food Standards Agency – Very low levels of bute found in Asda 'Smart Price Corned Beef'". food.gov.uk. 9 April 2013. Retrieved 10 April 2013. ^ Neville, Simon; Meikle, James; Carrington, Damian; Harding, Luke (11 February 2013). "Tesco says some of its value spaghetti bolognese contains 60% horsemeat". The Guardian. London. Retrieved 11 April 2013. ^ NHS: Drugs used in Rheumatic Diseases and Gout, 2012 Archived 29 April 2013 at the Wayback Machine: "PHENYLBUTAZONE (Named patient only, for the treatment of ankylosing spondylitis)"
^ "empty" (PDF). atsdr.cdc.gov. 27 January 2012. Retrieved 15 February 2013. ^ "Phenylbutazone (NSAID) (Chemical Page)". wildpro.twycrosszoo.org. 2 January 2011. Retrieved 15 February 2013. A non-steroidal anti-inflammatory drug (NSAID) commonly used for the treatment of musculoskeletal disorders in horses. Effective in ruminants but generally prohibited for use in food-producing animals due to risks of residues causing rare but potentially fatal side-effects in humans. ^ "Phenylbutazone – National Library of Medicine HSDB Database". Toxnet.nlm.nih.gov. Retrieved 15 February 2013. ^ James Forsyth. "The horsemeat scandal shows the true extent of Europe's power in Britain". The Spectator. Retrieved 15 February 2013. ^ Joe Drape (8 December 2012). "Racetrack Drugs Put Europe Off U.S. Horse Meat". The New York Times. Paris. p. A1. ^ "UK horsemeat scandal spreads to Europe – World Socialist Web Site". Wsws.org. Retrieved 15 February 2013. ^ "Equine infectious anaemia (Swamp fever)". Department for Environment, Food & Rural Affairs. 1 February 2013. Retrieved 13 February 2013. ^ "Commission decision of 23 April 2007 on protective measures with regard to equine infectious anaemia in Romania" (PDF). 2 May 2007. Retrieved 13 February 2013. ^ a b Nicholas Watt, chief political correspondent (10 February 2013). "Contaminated horsemeat could harm health, warns environment secretary | Society". The Guardian. London. Retrieved 5 March 2013. ^ Sawer, Patrick (10 February 2013). "Horse meat scandal: How horses slaughtered in Romania end up on British plates". The Daily Telegraph. London. Retrieved 5 March 2013. ^ "Merck Veterinary Manual". Merckvetmanual.com. Archived from the original on 26 November 2010. Retrieved 25 February 2013. ^ Stephens, RM; Casey, JW; Rice, NR (1986). "Equine infectious anemia virus gag and pol genes: relatedness to visna and AIDS virus". Science. 231: 589–94. doi:10.1126/science.3003905. PMID 3003905. ^ "Rare Horses in EIA/HIV Research Rescued From Dangerous 4,500-Mile Journey". PR Newswire. 15 August 2011. Retrieved 15 February 2013. ^ Hutton, Will (4 February 2012). "The Observer newspaper: The meat scandal shows all that is rotten about our free marketeers. 17 February 2013". The Guardian. London. Retrieved 24 February 2013. ^ Nelson, Fraser (14 February 2013). "The Telegraph newspaper, article about horsemeat scandal, and also lack of enforcement facilitating exploitation of trafficked humans, 14 February 2013". The Daily Telegraph. London. Retrieved 24 February 2013. ^ Meikle, James (16 January 2013). "Horsemeat-in-burgers scandal prompts food hygiene fears". The Guardian. London. Retrieved 22 January 2013. ^ "Horsemeat Found in Burger in Ireland". Huffington Post. 15 January 2013. Retrieved 22 January 2013. ^ "Halal school sausages contained pork DNA, Westminster survey found". The Guardian. London. 14 March 2013. Retrieved 15 March 2013. ^ a b George Hook: (15 January 2013). "Horse and pig DNA found in some supermarket burgers – National News". The Irish Independent. Retrieved 16 January 2013. ^ Williams, Rob (16 January 2013). "Asda clears shelves of value burgers as horsemeat scandal knocks £300m off Tesco market value". The Independent. London. Retrieved 22 January 2013. ^ "Whitbread makes food pledge after horsemeat scandal". the Guardian. ^ a b 2013 Sports Calendar. "Horse meat discovery knocks £300m off the value of Tesco shares – Other Sports, Sport". The Irish Independent. Retrieved 22 January 2013. ^ a b "EU ministers to hold meeting on horsemeat". Reuters. 12 February 2013. ^ "EU ministers call for emergency testing amid horsemeat scandal". 13 February 2013. ^ "Horse Meat Scandal: EU Proposes Three-Month DNA Testing". 13 February 2013. ^ Neville, Simon (26 February 2013). "Frozen burger sales plunge 43% after horsemeat scandal |". The Guardian. London. Retrieved 26 February 2013. ^ a b Keena, Colm (17 January 2013). "Monaghan firm involved in horse meat controversy is part of Goodman empire". The Irish Times. Archived from the original on 18 January 2013. Retrieved 18 January 2013. ^ a b c d e f "FSAI Burger test results" (PDF). 15 January 2013. Archived (PDF) from the original on 18 January 2013. Retrieved 18 January 2013. ^ "Horsemeat scandal: Dutch trader Willy Selten arrested". Bbc.co.uk. 23 May 2013. Retrieved 28 May 2014. ^ Felicity Lawrence (22 October 2013). "Where did the 29% horse in your Tesco burger come from?". The Guardian. Retrieved 22 October 2013. ^ Grierson, Jamie (26 August 2016). "Three men charged over UK horsemeat scandal". The Guardian. London. Retrieved 27 August 2016. ^ "Viande de cheval : comprendre le nouveau scandale". Le Monde. Retrieved 2 June 2015. ^ a b "Coveney struggles to contain beef crisis as results withheld". Irish Independent. 26 January 2013. Archived from the original on 26 January 2013. Retrieved 26 January 2013. ^ "Aimez-vous les lasagnes au cheval roumain?". 10 February 2013. ^ a b "Three held in horsemeat mislabelling investigation". BBC News. 14 February 2013. Retrieved 15 February 2013. ^ "Horsemeat scandal: Three men arrested on suspicion of fraud". BBC News. 14 February 2013. Retrieved 14 February 2013. ^ "SA consumers also cheated with meat products, SU study finds". Stellenbosch University. 25 February 2013. Archived from the original on 28 February 2013. Retrieved 26 February 2013. ^ "The Reykjavik Grapevine – News from Iceland / Surprising Twist in Horse Meat Scandal". grapevine.is. 28 February 2013. Archived from the original on 4 March 2013. Retrieved 1 March 2013. ^ "Fréttir – Matvælaöryggi". mast.is. 27 February 2013. Retrieved 1 March 2013. ^ "IKEA suspends sausage sale in Russia due to horsemeat". themoscownews.com. 7 March 2013. Archived from the original on 30 April 2013. Retrieved 7 March 2013. ^ "Poland plant halts production over rotten meat row". BBC. 8 March 2013. Retrieved 9 March 2013.